Raspberries Make the Best Desserts! 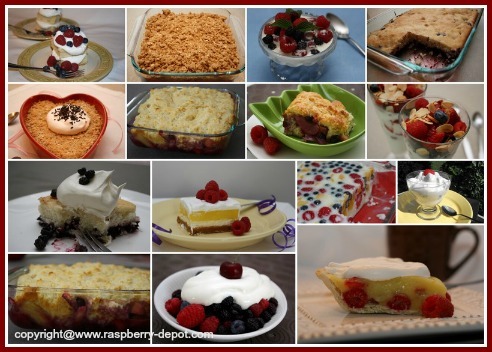 Raspberry Dessert Recipes are the BEST Dessert Recipes! Whether quick and simple, or elegant and impressive, a dessert serves to end the meal on a delicious note! Be careful not to make it dominate the food served before it, but it should not be lost or ignored either! If you've just served a hearty meal, then a lighter dessert is more suitable; likewise a more filling dessert provides a nice contrast to a lighter meal. A raspberry dessert recipe is a great choice for a dessert since many people love fruit as part of a dessert menu. Sometimes desserts are served on their own with a hot or cold beverage. Our family likes to enjoy dessert with a cup of hot coffee. Dessert sets no limit on your creativity! Take a look at the following links for more Amazing Raspberry Dessert Ideas! Some raspberry dessert recipes are best served warm, while others should be eaten chilled. Be careful not to serve your dessert too hot or too cold. In fact, for optimum flavour, frozen desserts should be allowed to stand at room temperature for a few minutes before they are served. No-bake desserts are great choices for hot summer weather. Your kitchen will stay cool, but your taste-buds will be fired-up! Looking for a great recipe for making a crumb crust? Now that you've created a delectable dessert, be sure to give it the presentation it deserves!